what kind of keyboard you use? Re: what kind of keyboard you use? Since no one has mentioned it, I'd like to bring up the future of keyboards. It uses my new favorite thing, organic LED (OLED). OLED is really cool because when the light is off, you can't even tell there's light there, so it blends in the surroundings. Not many things use it now, but my new minidisc player uses it and it's sooo nice looking. Anyway, here is a keyboard that uses it, and what's great is that each key has an OLED screen on it's surface and depending on the application you're using on the computer, the keys will change to show different things. No more need for keyboard templates, special gaming keyboards, etc. So cool! Since no one has mentioned it, I'd like to bring up the future of keyboards. It uses my new favorite thing, organic LED (OLED). I prefer to say OLEDs are a future of keyboards, not *the* A tiny, but important difference I think it's a safe bet to say that regular keyboards will still be around for many years. OLED is really cool because when the light is off, you can't even tell there's light there, so it blends in the surroundings. Not many things use it now, but my new minidisc player uses it and it's sooo nice looking. Could you post an URL that has pictures please? Well, yeah, that's what I meant of course. And let's not forget how expensive this keyboard will be at first, at least a couple of hundred bucks, I'm assuming. I haven't seen any other practical applications of OLED yet. I hear it's used as a gimmick in some alarm clocks. There are some prototype stuff out there like a OLED monitor, a flexible OLED newspaper that can be rolled up. So minidisc seems to be the only real useful application of it so far. I've just found out about AlphaGrips. Has anyone actually seen one of these? want the coolest (or most foolish) keyboard on the planet? i'd buy it if all i did was type but i need to see where the keys are for shortcuts in certain apps. the hardware spec sounds nice. Like on a piano, since there are no keys to look at when typing, your brain will quickly adapt and memorize the key positions. Within a few short weeks users increase their typing accuracy and find themselves typing up to 100% faster. I first read it as saying that the lack of printing would help you type faster since your brain wouldnt be distracted by the printing on keys, and i was going to point out that that contradicts most of what we know about the brain. but on second reading i think they are saying that the lack of lettering will force you to become a touch typer, which will in the long run lead to faster typing, which seems reasonable enough. pretty interesting idea actually. use many languages in the keyboards, because like that you don't have the other language's characters in the way to making distracting you from what you want to write. like to redefine theys keyboard keys to other stuff, allowing them to put themselves the labels in the keyboard. Still, this surelly isn't the keyboard for me. I like to have the letters there, even if i know where they are. yesterday I have experienced with a Cherry Cymotion Expert keyboard. The keystroke is really silent, much more silent than on my MS Wired 500 keyboard. I think I will do another update to this keyboard, if I have money. The bit under the wrist rest is a MIDI keyboard. Flash demo here link on left. Can anyone recommend a good wireless keyboard mouse set? A Microsoft or Logitech is the best choice. Try to spend a few extra money in a decent combination, mostly because cheaper ones tend to have weak range and disconnect mysteriously from time to time. I use a Chinese Rs.250/= (approx $5.00) Zen keyboard. Have some recognized makes lying around eating dust... the keys on this one are just too comfy and I haven't had any problems in the 2+ years I've been using it. I even love the Zen mice, I find them way more comfortable than a MS or Logitech mouse. I loved the Microsoft Natural Multimedia Keyboard so much I bought five of them for future use. Wow, you guys are keyboard freaks...I'm starting to wonder if mine is inadequate now! I have an ancient old Microsoft natural (? the ergonomic kind) keyboard that I rescued from the trash at the place I used to work four years ago...the wrist rest part is starting to turn all shiny from where my hands rest, but hey, it still works! I might have to go shopping now, though! do you have a photo from this keyboard? Sorry, don't have a photo handy but it's just a plain vanilla keyboard. 107 keys (regular set + power, sleep & wake). My main Keyboard is the logitech G15 - The Big one with LCD screen on it. Its very good for games and macro tasks. 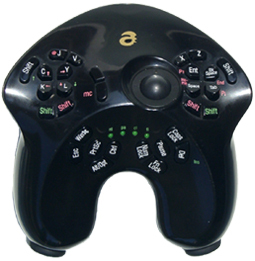 Its a mini Keyboard, With Joystick built in which can be used as a mouse or a joystick in games. I use it on my media center pc, which i also play some games on, Its very handy and small so can be placed anywhere. But ive always wanted this keyboard.. http://www.artlebede.../everything/optimus/ Anyone tried one?